Are you looking for a first date idea that will help you see if this person is a good fit? Or maybe you’ve been dating someone for a while, but you could use something a bit more exciting than dinner and movie? Why not get outside of your comfort zone and try out an adventure date? If you live in Colorado, there’s no shortage of exciting ways to spend a day to get closer to someone special. Plus, there are few things that can bring two people closer than a real adrenaline rush. White water rafting is one of the best first dates that there is if you’re a lover of adventure and the outdoors. The combination of paddling through exciting rapids and chatting lazily as you float down calm, gorgeous stretches of the river is a great way to get to know one another while having an experience that brings you closer together. Rafting is also ideal for couples who would like to take a weekend away from the city and spend time adventuring during the day and snuggling under the stars next to a fire at night. At Raft Echo, we offer multi-day rafting trips for those looking for a full-on nature experience, or cozy glamping tents for those who would like a luxurious bed to sleep in while still experiencing the rustic beauty of nature. What old Western movie isn’t complete without a rugged cowboy galloping through fields with a beautiful woman at his side? Why not take a cue from these movies and experience a romantic day of riding horses in the beautiful Colorado wilderness with the one you love (or may soon)? You’ll find horseback riding adventures in every corner of this beautiful state, some around national parks and others along simple trails just outside of the suburbs. For those who love animals and want to spend a day in the sun, horseback riding can be a great way to bond with each other and with nature. If both you and your date are thrill seekers, try a high adventure zipline ride at the Royal Gorge Bridge in Colorado. At over 1,200 feet above the Arkansas River below, this is the highest zipline in the United States! Here you can face your fear of heights and make a memory together that you’ll cherish for the rest of your lives together. Not to mention, you can take this opportunity as an excuse to spend a day, or a weekend, adventuring around the Royal Gorge area, where you’ll find romantic train rides, hiking trails, eateries, and more. Hot air balloon rides are an amazing combination of romance and excitement. When it comes to an adventurous anniversary date idea, you’ll find a hot air balloon ride hard to beat. Imagine sipping bubbly and holding your loved-one tight as you soar over rolling planes and rugged mountain peaks. Plus, hot air balloon rides are an adventure that even many of the more cautious of us can get excited about. Hot air balloon rides leave all of the work to the operator, so you can spend the entire time enveloped in romance. 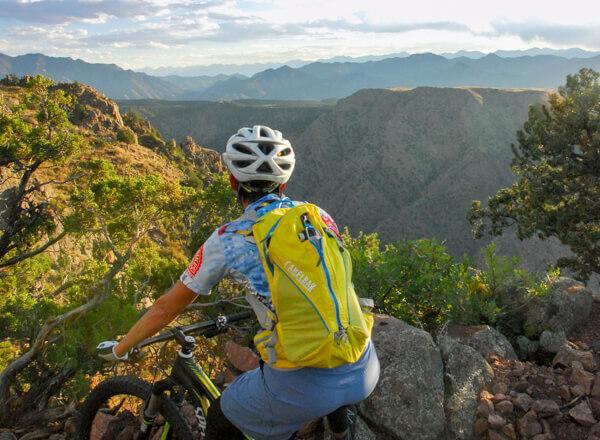 Mountain biking is one of those versatile adventures ideal for an adventure date. With more and more biking trails popping up all around Colorado, it’s as easy as ever to find a trail just right for you and your date. Is your old bike more of an antique with a rusty chain and gears that don’t work? No problem! This is a great time to demo a pair of fat tire bikes – they’re more stable than the bike tires of old, not to mention a lot of fun to ride. If you aren’t sure where the nearest trails are, just hit up the shop you rent from. Chances are they’ve got guide books and better yet – the insider knowledge on the best trails around. To make things even easier, most bike shops even have bike rack rentals that fit a car hitch or on the back of a trunk. Adventurous date ideas are an amazing way to not only enjoy your day, but create memories together than you can look back on fondly. Rather than spend date night on the couch or at the local eateries and bars, get out of your comfort zone and boost the romance by taking advantage of the endless adventures available in Colorado.